Design, manufacture and installation of signal structures and bridges, rolling stock metalwork and CCTV mounting solutions & outdoor cabinets. Fabricators of Access for All bridges, walkway bridges, cable bridges, gantries, cantilevers, straight posts and LOC platforms. Underframes, cable metalwork, electrical enclosures, cab back walls, body end cubicles and structural metalwork. Fixed and tilt over columns & towers, equipment enclosures, reader posts and CCTV mounting brackets. The addition of MTL Group, accredited to BS EN 15085 Class 2 and BS EN 3834-2, more than doubles WEC's engineering capacity. The Group now has almost 600 staff working across five sites in Lancashire, Yorkshire and Merseyside. Energy saving, eco-friendly & offering increased operational ability - the Fibre laser is likely to be a BIG success! 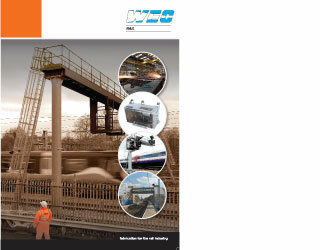 WEC Rail is a leading force in providing innovative design, fabrication and installation services to the rail industry for products including bridges, signal structures & gantries, rollingstock metalwork, electrical enclosures and CCTV products. In addition, WEC Rail is a leading rail repair provider. To operate so competently WEC Rail keeps as much work in-house as possible, and employs a dedicated design team, expert fabrication and PTS trained installation team, eliminating the need for external contractors. WEC Rail has specialist facilities at its disposal enabling an impressive in-house capacity which includes heavy and light fabrication, laser tube & box cutting and precision machining. The combination of these expert employees and on-site specialist facilities enables WEC Rail to provide a design to installation service carried out at one site at a consistently high standard, with reliable lead times and at competitive prices. WEC Rails success in the industry has led to contracts with the likes of Corus Rail, Atkins and Balfour Beatty. The company takes credit for many of the rail structures across England and Wales, these include signal posts, cantilevers, gantries, security CCTV and bridges. Additionally, further demonstrating its commitment to the industry since 2006 WEC Rail has been heavily involved in the governments DfT's "Access for All" programme. We are CWRVC EN 15085-2 accredited and adopt the FAI approach in all we do. Visit our quality standards page and view our ISO 9001:2008 Quality Management, and RISQS (formerly known as Achilles Link-up) approved certifications.